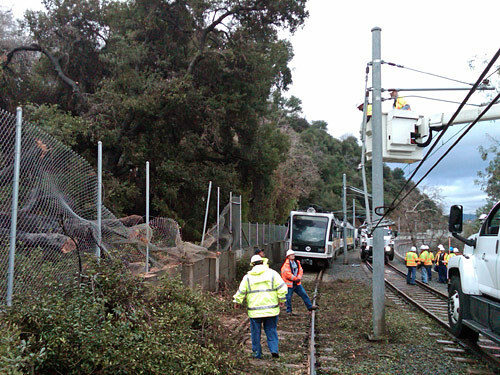 Tree damages overhead catenary wires and blocks Gold Line tracks between Highland Park and Mission stations near the Arroyo Verde road crossing and the Arroyo Seco Bridge. Photo: Luis Inzunza. Northbound passengers boarding bus bridge at Southwest Museum Station are transported to Mission Station to continue Gold Line service. 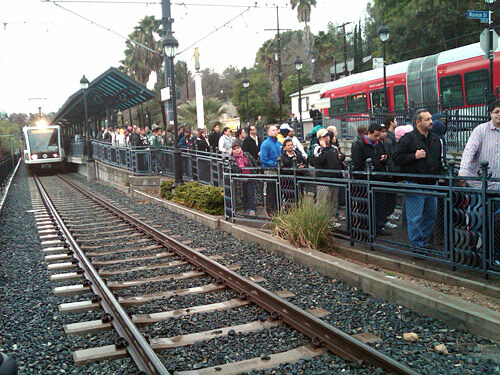 Southbound passengers boarding waiting buses that bypass the blocked tracks are transported to Southwest Museum Station, where they continue to their Gold Line destinations. Photo: Luis Inzunza. At approximately 4 a.m., a tree fell on the overhead power lines of the Gold Line at the Arroyo Verde road crossing just north of the Highland Park Station, blocking both tracks and damaging overhead catenary wires. Repair crews are on the scene and expected to clear the southbound track to enable the single tracking of trains within two hours or by 1 p.m. Normal operation may return as soon as tomorrow (Saturday).